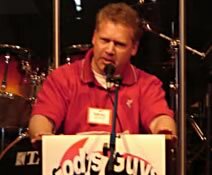 Founded in March of 2004 as the "Foresight Bible Study" for men with an emphasis on learning together ways / a lifestyle to become the best: husband, dad, son, brother, employee, employer, neighbor, friend they could be; by applying principles learned from the Bible and their own life experiences. Today, this group of men meets every Saturday at 7:00 am at a local Caribou coffee shop. God's hand has truly been on this group over the years and has reached many that did not know Jesus. Foresight Bible Study attendees have helped one another on many occasions through difficult times in their life, and collectively as a group have monetarily (through a benevolent fund they have developed) and physically assisted where necessary many individuals and organizations through a variety of lifes challenges this world presents. Stemming from the success of this group, the founder of the Foresight Bible Study group (Jeff Asfahl) at the urging of a good friend - (yes, Jesus too) underwent the task of organizing seminars for youth to learn about the proper / Biblical perspectives associated with their leisure time pursuits - such as; athletics, drama, band, hunting, fishing, etc. The first event was launched in the Spring of 2007. Today, known as Foresight Ministries, the organization offers educational seminars, youth camps, leadership education and training, and non-denominational church / worship services at weekend youth events.